Alongside Midwifery Unit, the first in Canada at Markham-Stouffville Hospital. Pregnant women tell midwife Carol Cameron that they want the best of both worlds: the consistent and intimate care of a midwife and the security of a hospital birth. That vision became a reality on Tuesday at Markham-Stouffville Hospital, north of Toronto, when staff officially opened the Alongside Midwifery Unit, a midwife-run and operated space that administrators say is the first of its kind in Canada. It is the latest step toward the advancement of midwifery in the country as an autonomous profession, Ms. Cameron said, giving midwives the opportunity to “shine” in a hospital setting. “It’s time that we did this on our own and cut the strings, if you will,” she said. Ontario and Alberta were the first provinces to legally recognize the practice of midwifery in 1994. It is now an option for most women in Canada, but midwives are still seeking regulation and funding in the Yukon and on Prince Edward Island. In regulated regions, midwives can operate out of independent birth centres or hospitals where they have access privileges. 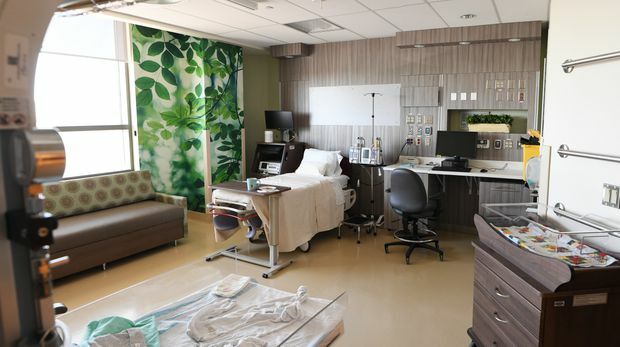 The Alongside Midwifery Unit at Markham-Stouffville, however, provides a space where midwives can work independently out of a hospital and become a permanent fixture there. It includes specially-designed birth suites with pools for water births, Murphy beds and birthing slings. An in-hospital midwife will staff the unit at all times, Ms. Cameron said, to serve as a mentor to younger midwives using the facility and assist with births. The unit also allows midwives and physicians to work together, particularly if a woman develops complications during birth and requires medical intervention. According to Lauren Sledziewski, a mother of three, close collaboration between the two professions can be beneficial for women. Ms. Sledziewski has given birth to all her children with the assistance of a midwife at Markham-Stouffville, but complications in her first pregnancy led to a cesarean delivery and consultations with an obstetrician for her following pregnancies. Ms. Sledziewski was able to have a natural birth with no intervention for her third child. She credits achieving the birth process she wanted to the joint effort of midwives and obstetricians. Access to birth centres, where midwives can operate independently outside of a home or hospital setting, is limited in Canada—there are only three in Ontario and wait-lists are long, Ms. Cameron said. Women who may require an epidural during delivery are encouraged to see a midwife at a hospital rather than a birth centre, as it’s a safer option, but some hospitals limit the number of midwives that can use their facilities, she said. Not only will obstetricians be present to give quick access to emergency care if needed, Dr. Peters said, but midwives will also have the opportunity to assist with cesarean sections. Ms. Cameron said the unit has been an aspiration for over 12 years and was inspired by similar units in Britain and the Netherlands. It is funded by the Ontario Ministry of Health, Markham-Stouffville and the midwifery-practice groups that operate out of the hospital. Usage of the six-bed unit will be studied as it operates, Ms. Cameron said, with hopes of a future expansion to include a clinic that midwives can use for check-ins throughout a pregnancy. “We’re all excited to see how the unit evolves,” Dr. Peters said.